The U.S. Department of Labor has set new regulations demanding that advisors working with retirement accounts or advising on retirement issues must be fiduciaries, and that new regulation has thrown the financial advisory industry into a whirlwind. As financial advisory firms try to determine which of their advisors must be fiduciaries and advisors try to determine how to answer the questions they get from investors, many industry experts wonder how much the entire “fiduciary’’ issue matters to consumers. Spectrem’s study on the investor-advisor dynamic, Advisor Relationships and Changing Advice Requirements, asked investors to describe what “fiduciary’ means to them and just how important it is that their advisor serve as a fiduciary. There is obviously some confusion surrounding the issue. In general, the wealthier the investor, the more knowledgeable they tend to be about investment issues, and the Spectrem report proves that wealthier investors certainly believe they are more knowledgeable. Among the Ultra High Net Worth segment of investors with a net worth between $5 million and $25 million, 92 percent said they understand what a fiduciary relationship is. Oddly, only 82 percent of Millennial and Gen X investors feel they know what a fiduciary is. Considering the new regulations, it is likely that percentage will increase, because the topic is going to be brought up much more often in advisor-investor conversations. But when it is brought up, do investors know what they are asking? The most reliable definition of a fiduciary is one who always acts in the best interests of the client. But when the UHNW investors were given five definitions of a fiduciary to choose from, only 33 percent chose the correct response. An equal percentage said a fiduciary relationship is a “legal or ethical relationship”. While a fiduciary is a legal relationship, investors may not know what the legal requirements of the relationship are. Almost one-quarter of UHNW investors defined a fiduciary relationship as one “involving the care of assets” which does not cover the investment aspect of the relationship at all. Even less specific is the response “a relationship based on confidence, good faith and trust” which was selected by 8 percent of investors. The confusion over the definition extends to the confusion over whether investors know that their advisor is a fiduciary. 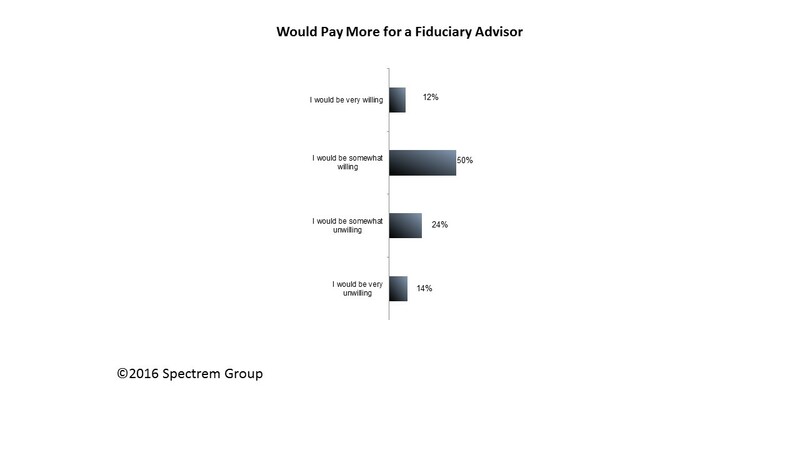 Almost84 percent of UHNW investors believe their advisor is a fiduciary. The Spectrem report segments investors based on their level of advisor dependency, and it is not surprising that the most advisor-dependent investors almost all believe their advisor is a fiduciary. Because of the increased legal liability due to a fiduciary status, an advisor who is a fiduciary sometimes can be more expensive than one that is not. This is certainly significant going forward as many advisors operating differently under the new fiduciary standards are possibly going to be charging more for their services. That change is likely to impact the investor-advisor relationship. Less than 60 percent of UHNW investors are willing to pay more in fees for a financial advisor who is a fiduciary. The apparent unwillingness of more than 40 percent of investors to pay more for fiduciary services is going to put a damper on existing advisor-investor relationships. There is much that is yet to be determined and understood about the new fiduciary relationships, and if advisors and providers are confused, imagine the confusion of investors. The new fiduciary standards are going to require two different conversations with investors talking about retirement issues. Existing clients are going to require an understanding of how the new regulations affect the current relationship, and new clients are likely to have more questions about the fiduciary standard and how it affects investment decisions related to retirement. Another issue created by the new fiduciary standard is that investors are likely to have new expectations for all advisors and all investment advice whether they impact retirement accounts or not. For example, how do you explain to an investor that you are a fiduciary for their retirement accounts but not for their other accounts? Advisors and providers are going to need new answers to the question about their fiduciary status.